I had decided by the end of my second year reading Economics and French that I wanted to work, and was naturally attracted towards international finance or banking. So immediately after returning from my year abroad in Grenoble I started applying for graduate positions with leading banks, accountants, and even the Bank of England, and spent the following six months refining my CV, chasing up applications, going to first, and sometimes second interviews, taking psychometric and other tests, and eventually received two or three offers which really interested me (I also received good feedback from others along the way which helped me to decide what kind of work and work environment I was best suited to). I opted to join the two-year management training programme for what was then Lloyds Bank International, and spent a thrilling 24 months in London, Amsterdam and Paris, before being offered specialist Financial Markets on-the-job training in London and New York. That led to an opportunity to set up a Treasury dealing unit in Toronto, Canada, and after a couple of years I moved over to standard corporate banking in both Toronto and Montreal (back to French again!). After four years in Canada, I was offered a Senior Corporate Account Manager position in the bank’s large Brazilian business, spending four years in Sao Paulo, then moving up to become Branch Manager in Belo Horizonte, a huge centre for mining and steel industries. I should mention that I married Marilyn, a fellow-student at reading, just after graduation, and we both loved the international life, adding two children and three new languages (Dutch, Portuguese and Spanish) along the way. During this time I also followed a regular programme of professional development including residential courses at UK business schools. The Henley Business School at the University of Reading. Students can pursue a variety of joint degrees with languages, business, and economics. After 15 years away, I returned to work in UK Commercial Banking, still with Lloyds, but by this time international opportunities were on the wane. Local executive recruits were doing the jobs previously done by expatriates, and this is very much the case today. The previous pool of UK managers abroad had now become an international cadre of multi-national management, with as many Brazilians working in London as Brits in North and South America combined. From a career point of view, however, it is vitally important to work in the company’s home-country so as to be able to act within and be seen as part of core power networks in the organisation. Out of the blue I was parachuted into the Lloyds Private Banking operation with a view to taking it to a new level, which entailed the pleasure of an office in Mayfair – and the pain of studying and sitting for professional exams as a regulated investment adviser! Two years there led to two years running private banking and investment funds in Luxembourg, and then a move up to become CEO of Lloyds Belgium (back to French again..). In business terms, the time in continental Europe was fulfilling and successful, and led to an opportunity to become Country Manager of Colombia, based in Bogota, and three years later Deputy Director for Latin America. 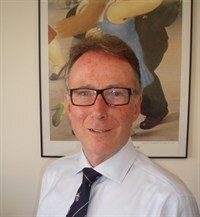 I had by now spent an amazing 28 years at Lloyds Bank, easily outlasting all the 15 or so graduates who had originally joined with me at the outset (many of whom followed extremely successful careers elsewhere). As the recession hit in 2007, I decided to take an early retirement package and see what else I might do outside of banking. I became Chairman of an international chamber of commerce in London and accompanied the Lord Mayor on trade missions to Colombia; I was asked to lecture at the European School of Economics, running modular classes in International Business, Global Challenges, and Innovation Management; I formed a private consultancy and in time became a Non-Executive Director of a fast growing AIM-listed company drilling oil in South America. I have time to play a bit more golf and I have just started taking piano lessons! Any student reading this is probably unlikely to spend so long with the same company – and I think that is on balance for the better – but if they share the passion I have always had for international business, today’s globalised world offers a huge variety of opportunities. Each will measure success in different ways, but I believe that it is really important to find work that you enjoy, to commit to it by application and training, and to find the work/life balance that works for you. Looking back, the platform provided by my degree at Reading was simply the perfect start. 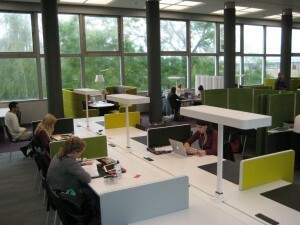 A group study area in the University of Reading main library. Your studies here may be “the perfect start” of a career that could take you anywhere in the world. If you’re a Reading alumna or alumnus, we hope to see you at future reunions. But you don’t have to wait until then to get in touch. Tell us your story. 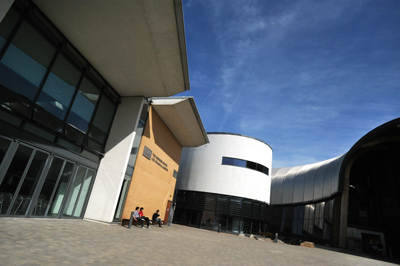 The University of Reading publishes alumni profiles online. If you’d like to share your story, all you have to do is fill out an online questionnaire. We’re proud to say that more than a dozen Modern Languages graduates have already filled out alumni profiles, and we hope that many more of you will choose to do the same. When you do, please consider submitting your story for the “Meet a Reading Graduate” section of the blog of the Department of Modern Languages and European Studies. If you’d like to tell us where your Reading degree has taken you, and perhaps to share a few memories of the department, please get in touch with our Alumni Officer, Dr Irene Fabry-Tehranchi. We’d love to hear from you. For more information about European Studies, as well as the other degree programmes in languages at Reading, please visit the website of the Department of Modern Languages and European Studies. To keep up with all of the Department’s students, staff, and alumni, follow this blog, like us on Facebook, and subscribe to our Twitter feed.